In a little under a month, Ryerson will be full of students parading down the streets at orientation and Week of Welcome events. For those of you joining us on campus for the first time in the fall, you’re probably busy thinking about what your classes will be like and what to bring with you to the big city. But there’s one thing that you’re probably not thinking about – water. Yes, I meant water. That thing we drink, shower with, and use on a daily basis but don’t really think about where it comes from. A number of years ago students noticed a huge shift with water on campus. Many water fountains stopped working and never got fixed, and were instead replaced with vending machines full of bottled water. Students were forced to pay $2.00 for a glass of water, and seeing this as unfair, decided to work together and launch the bottled water free campaign – a campaign to raise awareness about the privatization of water and advocate for clean, free, and public drinking water on campus. Following a campus-wide consultation, the Ryerson Students’ Union (RSU), Continuing Association Students’ Association at Ryerson (CESAR), and Ryerson University came together to sign the Ryerson Water Pledge – a commitment to end the sale of bottled water on campus by September 2013. This commitment was the first in Ontario and fourth in Canada of its kind made by a university. But why, might you ask, would we want to eliminate bottled water? Here’s a few quick fact about the bottle vs. tap! 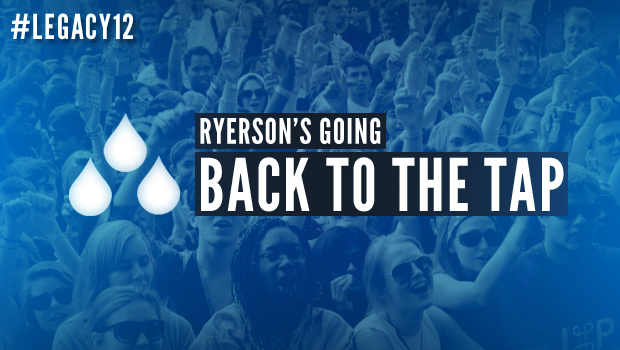 Since launching the bottled water free campaign, there have been a number of positive changes to how Ryerson student access water. New fountains and refill stations have been installed throughout campus. Orientation Week, the Week of Welcome, and Parade & Picnic are once again bottled-water free. Throughout the two weeks, the Ryerson Students’ Union will be providing students thousands of free reusable water bottles made from 100% biodegradable resources (we even made a video about it: http://www.youtube.com/watch?v=Wm59UKWjA8Y). We’ll be offering free public tap water at all of our events and are working closely with other groups on campus to make sure they can do the same. The bottled water free campaign is about more than just bottled water. It’s about shifting the conversation back to the tap to support our public water system. When you come to campus, make sure to bring a reusable water bottle with you, or grab one from one of our many events throughout the year. Using a water bottle ensures you’re doing your part to reduce the waste created from plastic bottles, continue to push for more water fountains on campus, and access water as it always should be – free.